When your windshield or other auto glass breaks, you'll want to get it fixed soon; that's when it's nice to know that 777 Auto Glass can have replacement glass installed quickly. Our staff is fast, friendly, and has years of experience providing auto glass replacements and windshield replacements in all types of cars, trucks, and SUVs. Click on a link to the left to schedule service or get a free, no-obligation online quote. Finding time to replace some broken car windows can be difficult in today's hustle and bustle of everyday life. 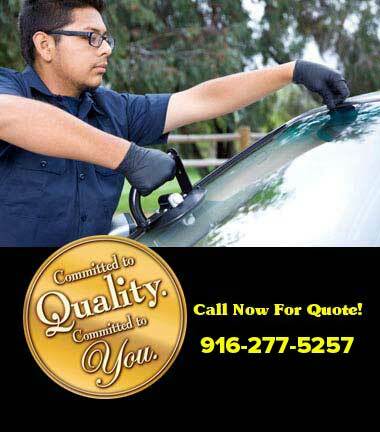 That's why we provide free Mobile Auto Glass Replacement Service throughout Sacramento and the surrounding communities. When your auto glass or windshield breaks, we'll send one of our expert installers out to you to replace the glass. In fact, we can even meet you at work, school, or any other place that allows us adequate room to work. How Long Does A Replacement Take? When you come to 777 Auto Glass to replace your windshield or broken car windows, we'll try to get you back on the road as soon as we can. During the replacement process, the technician will have to remove the old glass and any debris from the frame and clean the area to prepare it for the new glass. The new glass will then be installed using urethane (special glue) to bond the glass to the frame of the vehicle as well as a molding which helps seal the area around the edge of the glass. This process can take as little as 20 minutes; however, before it is safe to drive away, it's important that the urethane has time to cure properly. Curing times can vary based on weather, temperature, and the type of urethane used in the replacement, so it's best to check with your installer for a safe cure time before driving the vehicle.